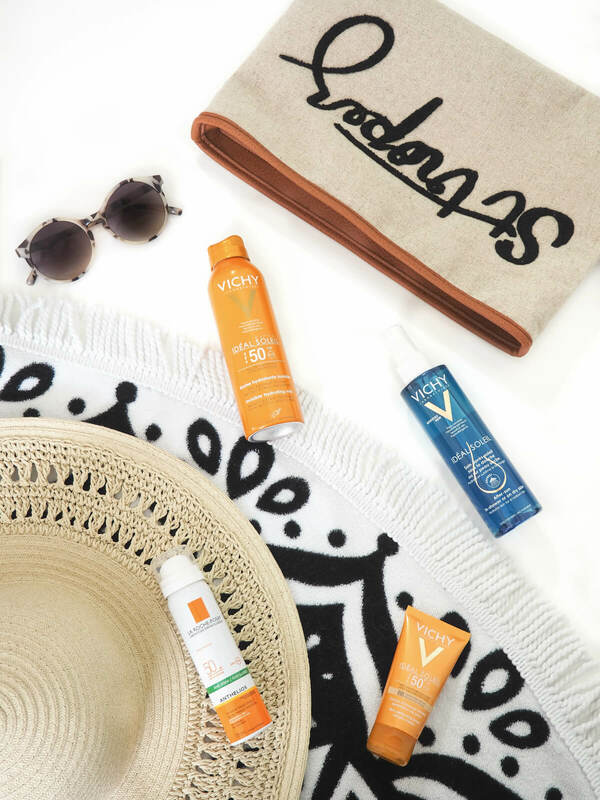 I cannot tell you how happy I am to be able to talk about suncare, it seems like we’ve waited a lifetime for this summer to come around! As a lot of us know suncare is important at all times of the year but it is especially important in the hotter months. Here in the U.K these are few and far between, and because of that we can be a little ‘forgetful’ when it comes to protecting out skin on hotter days. Vichy have launched a beautiful suncare line which I am now dubbing ‘the lazy girls suncare’. The Ideal Soleil 2017 range focuses on high UV filter protection but with a quality skincare base. All the products are non-comedogenic (which means they won’t clog up the skin) and are designed to counteract the dehydration caused by the sun. Tinted Velvety BB Cream SPF 50+ / So I have a love hate relationship with BB creams. I love the light coverage for summer, they let my skin breathe and my freckles show off, but I find they can be very orange on me and the SPF can give them a weird texture and finish. This offering from Vichy is a revelation, it’s factor 50 and has a beautiful silky texture that makes you skin feel so soft (no doubt because it’s packed with Hyaluronic Acid). I was sure that if it was pale enough for me it would be way too pale for my Mum (who just has to smile at the sun before she turns a beautiful caramel brown!) but it blended beautifully with her skintone too. Witchcraft I tell you! Invisible Hydrating Mist SPF 50 / This mist is my perfect suncare solution. I cannot bare the feeling of heavy creams on my skin and a lost of mists are actually quite oily but this feels like nothing on the skin. It’s enriched with Glycerin and Mineralizing Thermal Spa Water for all day hydration and it absorbs instantly and leaves a very light sheen to the skin. It also smells incredible (think fresh and floral rather than typical suncream), if you hate a heavy suncream this is definitely for you! Double Usage After Sun Oil / Remember when I said this was lazy girls suncare? Well say hello to the in shower after sun oil. I cannot tell you how many times I have said ‘GENIUS!’ to myself whilst looking at the bottle. You can use this on dry skin after showering just as you would a usual body oil but you can also pop it on to clean wet skin after using your usual shower gel before rinsing it off. It has a unique formula filled with Shea Oil, Apricot Kernel, Blackcurrant Seed Oil and Echium Seed Oil. It’s a formula that is rich in Omega-3, 6 and 9 and soothes sun-parched skin whilst promoting barrier repair and extending your tan by 61%! Anthelios Anti-Shine Invisible Mist / If you are looking for a high quality SPF to wear over or under your makeup then this is the product for you. Designed for oily skin, this invisible mist doesn’t need to be rubbed in so it’s perfect for topping up throughout the day. It’s made of the patented molecule Airlicium (previously used by NASA!) which is comprised of 99% air and 1% silica which absorbs up to 100x it’s own weight in sebium, in English this means it will keep the skin shine free and fresh all day with a beautiful matte finish. "Fathers Day with Star Wars Identities"
I like the sound of the double use after sun oil. I don’t like the after sun oils because they leave your skin greasy, but this one that can be applied during the shower sounds like a brilliant solution to this problem. I love the idea of the invisible mist because I often forget to apply sunscreen before my make-up, problem solved!! What some great sounding sun care, I love the sound of the bb cream, I think I might have to get myself some of that ready for the summer sun. It is so nice to see a feature on sun protection. Something we should all know about, but sometimes need a gentle reminder. Last week I saw a friend on Facebook showing off her sunburn! And her teenage daughter being jealous of it. I was horrified. I really like Vichy stuff; I’ve had Vichy suncare stuff before, and found it really nice. Doesn’t feel greasy and smells fab. Don’t forget to protect your skin everyday, not just when it’s hot although it doesn’t sound like that will be a problem with these products. Do you know if they are cruelty free? You just reminded me that I need to get suncare for our summer holiday! It’s so easy to forget isn’t it!? The hydrating mist sounds awesome, I’m not too fond of thick creams either! I’ll look into buying some of the Tinted Velvety BB Cream. It sounds like it could feel more like a moisterizer than a suncream. I hate the sticky suncream feeling. Being SPF 50 is a plus too as I always get burnt! It’s not actually that expensive either! I have some other Vichy products which I like using but none of these. The BB cream sounds fabulous. I love the sound of the inviaible hydrating mist, as like you I don’t like my skin to feel heavy in creams!! The BB cream sounds really amazing. And I really like the sound of the hydrating mist,. Aargh! I wish I’d read this post sooner! I picked up Vichy’s Tinted Velvety BB Cream in Boots this afternoon, almost bought it, but then went for a totally different product I’d read great reviews on. Had I seen this first, I would most definitely have stuck with the Vichy one 🙁 Definitely going to pick one of these products up next time I see them on sale as they sound fantastic! Skin care is so important, especially in the sun, so it’s great to see so many more produts being sold to help now. Loving the sound of the after sun oil and the hydrating mist. May have to splash out on myself for once!